According to the report, demand for skilled finance and accounting talent has continued to gather pace in Malaysia throughout Q2 2017. The country continued to benefit from the offshoring of functions from higher cost locations in the Asia region, resulting in an accompanying demand for professionals to support these functions. 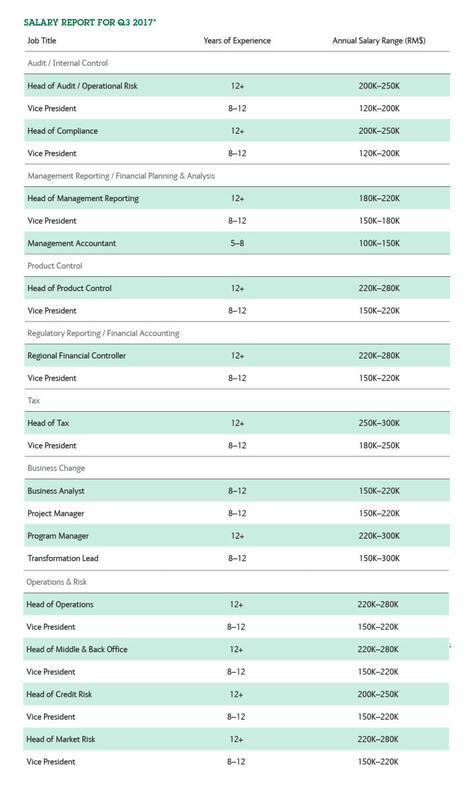 Steady increase in the demand for technical financial accountants and auditors. With companies in Malaysia growing manufacturing and supply chain operations, there is an increase demand for finance and accounting professionals with strong experience partnering with these operational business functions. Demand for shared services finance professionals remained acute in Q2 2017 with a growing demand of global talent. On the other hand, neighbouring Singapore is seeing contracting demand in finance and accounting on the rise. Contract professionals with a full set of accounts experience, financial planning and analysis expertise or business partnership skills were in high demand, with those from the Big 4 being a major plus for many businesses. Salary-wise, head of planning and analysis with 10–12 years of experience in Singapore can expect an annual salary range of S$140K–220K. 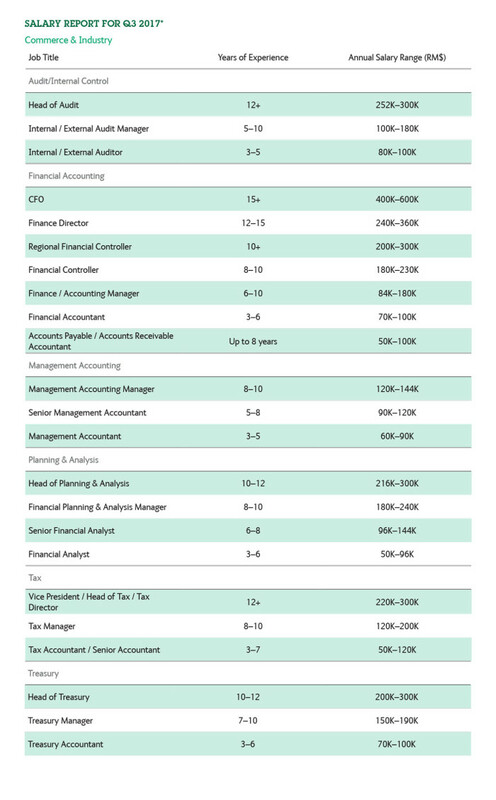 Click here for further findings on Singapore’s salary and job trends in finance and accounting. Meanwhile, the report also revealed that specialist finance roles, such as billing and revenue controllers were in demand in Hong Kong. 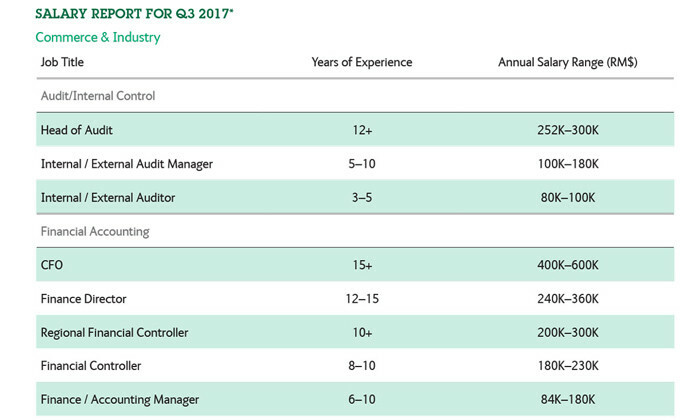 In fact, financial controllers with eight to 10 years of experience can expect an annual salary range of HK$ 720K–850M. Find out more about the Hong Kong salary and job trends for finance and accounting here. With digitalisation being adopted as a broad strategy across all companies, the continued drive for efficiency gains, and the consistent threat of cyber security attacks, the need for exceptional technology talent has never been greater. In Singapore, the spotlight is on data science hiring with the banking and insurance industries actively hiring data science and data analytics specialists. For salaries of technology roles in Singapore, click here. As for Hong Kong, banking IT professionals progressed from lukewarm to hot as banks grow their cash equities, derivatives, prime services and FICC desks in the region. In fact, Hong Kong is currently seeing a high demand for developers in Java, C++, and C#.NET – earning a salary range of HK$240k-720k annually. For salaries of technology roles in Hong Kong, click here. Throughout Q2 2017, there remained a steady demand for Banking & Financial Services professionals in the Malaysia market. The report showed a continued trend of global banks migrating and building functions in Kuala Lumpur. With firms trying to keep up with global regulatory standards, this resulted in core growth areas and hiring demand for professionals across financial markets operations, investment banking, wealth, risk and AML/compliance operations. Additionally, there is a fundamental need for strong business change teams, process engineers, business analysts, and project managers – thanks to the continued migration of regional and global processes to Malaysia. Additionally, hiring in the banking and financial sector in Singapore will remain optimistic in certain areas – especially in regulatory and corporate governance. In fact, the report showed that head of compliance in Singapore with more than 15 years of experience earns a salary range of more than S$250k annually. Full findings for salary and job trends in Singapore’s banking and financial market here. The banking sector in Hong Kong was hiring all levels of professionals for different support functions even if it isn’t at the volume expected. However, retail and private banking will continue to look for both frontline and support staff with skills in areas such as sales, digital and cross-border marketing, client eervices, client due diligence, and compliance. Compliance managing directors will be earning more than HK$2.3M annually. For further findings on the salary and job trends of the banking and financial services in Hong Kong, click here. Raising a family, the lack of work- life balance and wanting to care for family members are the top causes of women leaving the wo..
A global study of 25,000 business leaders reveals has identified 6 major trends that are keeping C-suite leaders on their toes in ..
After speaking to reporters on how Qatar Airways "has to be led by a man because it is a very challenging position," group CEO Akb..
Alice Fok, head of customer franchise, Citibank Singapore emphasises that a future-ready mindset is as essential as forward-compat..